Wine Travel Stories: Who Needs Chickens in the Vineyard When You Have California Quail? 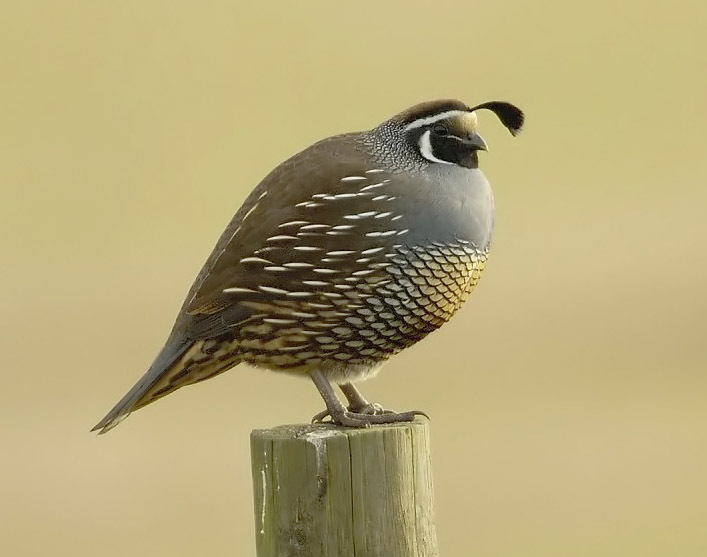 Who Needs Chickens in the Vineyard When You Have California Quail? May 2016 – One of the downsides of living in the country on the foothills of Sonoma Mountain is that you must haul your garbage bins up and down the hill once a week when the garbage truck comes. It was about 7:30pm this evening when I remembered I had not yet hauled up the recycle bin because it is so much larger and heavier than the regular garbage can. Therefore as the sun was sinking below a fog bank rolling in from the Pacific Ocean, I decided I should force myself to walk down the hill and roll the bin back up to the house. On the way out of the door, I thought it would be a good idea to turn on the drip irrigation for thirty minutes to bring a small amount of water to the 30 newly grafted pinot noir vines in my hobby vineyard of 120 vines. They had been grafted nearly a month ago from Dijon 777 clone to Pommard, because my neighbor convinced me I needed a little more clonal variety in my pinot noir vineyard. I had already suckered the new vines several days ago, and they were just beginning to bud out, but the normally calm May weather had turned hot for the last two days, reaching up to 90 degrees. Therefore, I flipped the irrigation meter on the 30 vines, as well as the roses I had planted at the end of each row. Walking down the hill I couldn’t help but admire the lovely peach and mauve sunset, made more impressionist by the softly rolling fog. As I neared the vineyard, I could hear water spraying in the air, and knew that some of the irrigation nozzles must have been knocked off. Sure enough, as I opened the vineyard gate, I could see water spraying in the air near two of the rose bushes. Quickly reaching down I tried to connect the black irrigation hose to the lose piece, and was immediately sprayed in the face by cold water. Finally I gave up and used a rock to hold the hose in place so the white rose bush received some water for 30 minutes. Then I checked the rest of the irrigation nozzles and discovered that most were operating correctly. 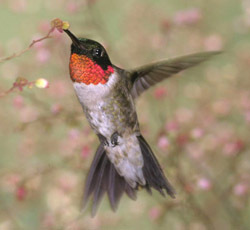 As I stood there in the fading light, I suddenly heard the “buzz thrum, buzz thrum” of a ruby-throated humming bird. Glancing over, I saw the tiny sweet bird taking a bath in the spray of the water I had just created near the roses. I watched in awe as his emerald and ruby wings shimmered in the glistening water and setting light of the sun. Then I heard scratching in the dirt. Looking up towards the top of the vineyard, I saw at least twelve California quail emerge from the bushes to scratch and feed in the vineyard rows. As I watched them in delight, I realized they were all nesting pairs, each with a male with his signature cocked comb and a plump female, most likely ready to give birth to a covey of babies. I had no idea there were so many California quail in my vineyard, and they seemed to be finding plenty of bugs and seeds to eat, because they scratched in the dirt and grasses like the chickens that organic and biodynamic vineyard owners use to till the soil. Who needs chickens, I thought, when I have a whole community of California quail? Then I noticed several brown sparrows pecking in the grass as well, and saw a pair of hawks float softly above in the evening breeze before they settled into a large California oak. All of the bird life immediately reminded me of my father, the ornithologist, and everything he taught me about wild birds as I was growing up. I knew he would greatly enjoy sitting in this vineyard tonight and watching all of the amazing wildlife slowly appear as long as you were still and quiet. “Be still! Be quiet!” I remember him saying so many times as I was a small child in the backseat of the truck, while he looked through binoculars at birds on a pond in the middle of nowhere, for what seemed like hours. So I stayed still and quiet in my vineyard, and the earth and her bounty rose up around me in a glorious symphony of bird, insect, and plant life – all encompassed by a peach colored sky and lavender fog. And then, in that stillness, I smelled a very delicate scent. Rising to my feet, I walked to the nearest grapevine and gently pushed the large green leaves apart to see that my vines were in full bloom. Tiny white blossom graced all of the baby grape clusters in the rare few days that are “bloom in a vineyard.” Very few people realize that wine grape vines go through a period of flower, and that the scent is soft and delicate. I lowered by nose to the tiny flowers and inhaled the sweet, but illusive scent which reminds me of a pale version of White Shoulders perfume with a hint of citrus. So it was with a light heart that I left the vineyard and pulled the large blue recycle bin back up the hill to my house. As I crested the hill and looked back, slightly out of breath, I saw the sun sink below the horizon in a pale pink glow. It was the first time in many years that I was rather grateful to the garbage company for forcing me out on such an evening to retrieve my recycle bin. Liz, Compliments! Beautiful writing, nicely descriptive--gorgeous illustrations depictive of Sunset in Sonoma County included.